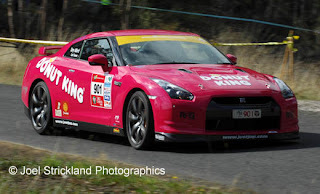 The pink R35 GT-R from Donut King has retired from the Targa Tasmania. They had an off at the Sideling stage that punchured the two front tires and damaged a rear wheel. The offical word on the car dropping out of the event is suspension problems. Suspension problems, probably a bent arm or two from the off. If you can't get the wheels to be straight again, the handling gets really difficult.